August 8, 2010 - Porter Airlines of Toronto has signed a firm order to acquire four Bombardier Q400 NextGen turboprop airliners and has taken options on an additional six Q400 NextGen aircraft. Based on the list price for the Q400 NextGen aircraft, Porter’s firm order is valued at approximately $120 million US, which could increase to $308 million US should all six options be converted to firm orders. The four aircraft will increase Porter’s fleet of Q400 and Q400 NextGen aircraft to 24. 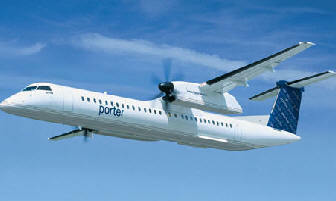 Porter took delivery of its 20th aircraft, and the 300th Q400 aircraft to be delivered, in April 2010. “Bombardier’s Q400 and Q400 NextGen aircraft’s quiet comfort, fuel-efficiency and lower environmental footprint help us to deliver on our ‘flying refined’ brand promise, and they continue to be the ideal aircraft for our operations based at the urban Billy Bishop Toronto City Airport,” said Robert Deluce, President and Chief Executive Officer, Porter Airlines. Optimized for short-haul operations, the 70- to 80-seat Q400 NextGen aircraft is a large, fast, quiet and fuel-efficient turboprop. It provides an ideal balance of passenger comfort and operating economics with a reduced environmental footprint. Including Porter’s order, Bombardier has booked firm orders for a total of 389 Q400 and Q400 NextGen aircraft, and as of April 30, 2010, 300 had been delivered. The aircraft are in service with 30 operators worldwide. Porter Airlines is a regional airline headquartered at Billy Bishop Toronto City Airport on the Toronto Islands in Toronto, Ontario, Canada. Porter operates regularly-scheduled flights between Toronto and locations in Canada and the United States using Canadian-built Bombardier Dash-8 Q 400 turboprop aircraft. Porter's operation at the Toronto airport was launched in 2006 after some controversy. A planned bridge to the airport was cancelled in 2003, leading to lawsuits between the airline and the City of Toronto. The airline bought the island airport terminal and evicted rival airline Air Canada Jazz from the airport. As of August 2009, Porter's operations at the airport continue to be opposed by Toronto's mayor, some City councillors, local community groups and nearby residents, but supported by some business groups and Torontonians at large. Despite the opposition, Porter has expanded its operations since 2006, adding more destinations and planes. Porter opened a new, larger, passenger terminal at the island airport in March 2010.